The Western Weekender has asked me to do a selection of articles on topics relevant to their readers. A question I get asked a lot is how can I stop getting spam emails. Spam emails may or may not be from valid companies, or they may be phishing emails which I covered in an earlier article. 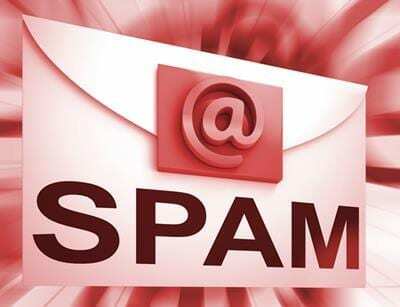 Addressing how to deal with spam is dependant on what type of email you have. This email type has been around since the beginning of the internet and unfortunately is showing its age. It is still common but is declining in usage. Your internet providers server holds your emails until you pull the emails down onto your PC using an email client/program. The server does not do any filtering or spam protection at all. The solution – most Antivirus packages have an offering that includes spam protection. They are a bundle of programs, not just Antivirus – they start at $100 and usually cover 3 or more PC’s. This is by no means an exhaustive list, if your current antivirus is not listed above, I have no doubt that they will have a solution with a Spam feature. Web-based emails have become the norm for home users. The more popular ones include Hotmail, Yahoo, Outlook, iCloud and Gmail. All of these have a version of Antispam built-in. It is quite basic by default but can be trained or tweaked to your satisfaction. If you use webmail and are receiving spam, then google how to optimise spam filtering for your webmail provider. On the web version of this article, I will link to some of the better how-to documents for the webmail providers. Gmail – Gmail already does spam filtering by default. You can train Gmail to be more aggressive with spam filtering or less aggressive by using filters. More information on how to do this can be found HERE. Hotmail / Outlook.com – Outlook also handles spam by default. Outlook.com is also training through the use of junk email filtering, blocked email senders, safe sender lists. More information can be found HERE. Yahoo – Yahoo webmail also uses filters and automatically sorts mail into SPAM folders. Information on how to configure is HERE. iCloud – Uses a Junk folder to filter Spam. Information on how to customise this feature can be found HERE. If your preferred webmail client is not listed here – they will have documentation on how to configure their spam filter – have a hunt for it. Business emails have typically been run from a customer-owned and operated mail servers. Your options are – You can purchase and run on premises antispam software on your server, or you can redirect your mail to go through a specialist mail cleaning company before the mail arrives at your server. There are benefits and disadvantages of both solutions. This is a complex area, for many years the only solution was to run spam filtering software on your own server. We used to run Symantec antivirus with the antispam option on our mail server. It was a great solution. Many vendors had similar solutions and most of these vendors still do. This software usually added a bit of overhead to the server workload and as generally updated daily. As technology progressed spam filtering moved up into the cloud. This works by redirecting your mail to a third party provider. This third party then scans and filter your email for virus and spam activity and forwards the clean email back to your server. They have the benefit of looking after millions of emails addresses and billions of emails. They can identify spam and virus activity quickly and adapt their programs to block them. At Nortec, we used to use GFI Mail Essentials. Rather than sending Spam through to us, it would hold the spam on their server and send us a summary email once a day with mail release options for the identified spam. These solutions when configured properly do stop most, but not all spam. It is after all in their best interest to offer a great end user experience. This solution uses a shared cloud-based solution to manage your mail. It is a superior solution with many advantages over the other solutions. The providers often bundle large amounts of cloud storage space and tools included. The providers also offer expanded spam protection at an additional cost. Microsoft has extensive protection information on how to configure Office 365 for Spam. More information on their addition protection option Office 365 Advanced Threat Protection can be found HERE.